On Friday, Iron Adriana Resources Inc. (CVE:ADI), (PINK:ANARF) stock leaped beyond its normal trading range in unison with the latest rapid developments of the company. The shares of Iron Adriana Resources Inc. formed a price gap, going up and forward on two markets on the announced final closing of the company's private placement. On the TSX Venture Exchange, ADI stock added 37.21% in value between the sessions on 4.3 million shares changing hands. The shares closed the week at $0.59, having strong buying pressure. 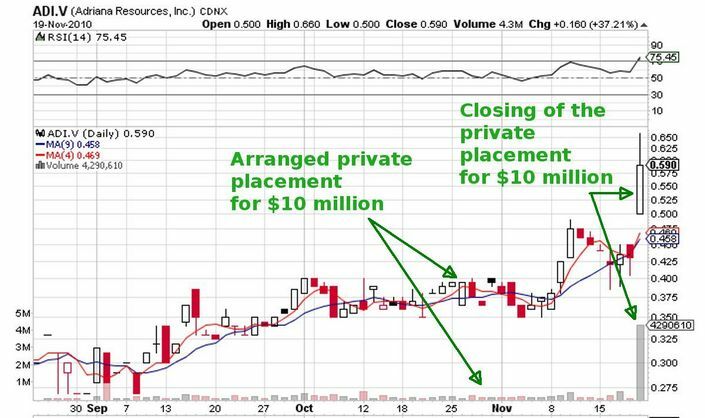 The largest volume of around two thousand shares was noted at the beginning of this month, a few days after Iron Adriana Resources Inc. released the closing of the first tranche of the private placement. In less than a month, Iron Adriana Resources Inc. succeeded to organize and close a non-brokered private placement for $10 million. Within that period of time, ADI stock has risen by 62%. It sounds reasonable that on the iron news for the iron company its share price jumped up, reflecting the positive news for the secured capital for the company's projects- the Lac Otelnuk Property located in Quebec and the deep-sea port facility located in the state of Rio de Janeiro, Brazil.